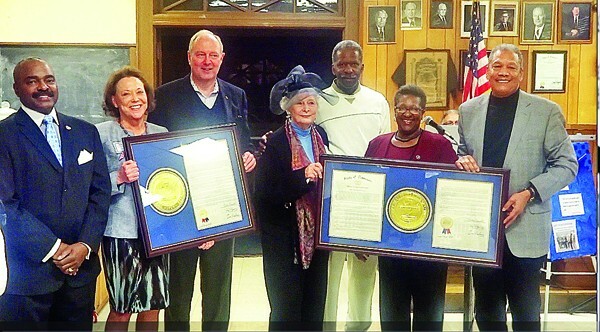 Shelby County Democrats honored some of their own Saturday night at the IBEW building on Madison Avenue. Here (l to r) are legislators G.A. Hardaway, Jeannie Richardson, Jim Kyle, Beverly Marrero, Reginald Tate, Karen Camper, and Larry Miller. Richardson, a state representative, and Marrero, a state senator, lost their 2012 elections but were cited for their service, as was former state representative Mike Kernell, unavoidably absent.